Google AdWords is an online advertising service developed by Google. It allows to display advertising with search results (paid search or Search Network), display banners (Display Network), video campaigns and more. Creating an user list on Google Ads: User lists can be used to target some contacts specifically (e.g. with higher bids) in the various campaigns on Google Ads. Use case: We know that subscribers of newsletters or loyalty card holders have a higher affinity to the company’s products than random visitors. Therefore placing a higher bid for them in the search network will show the company’s ads more likely with the search result. This brings the loyalty card holders more likely to the company’s web page and web shop. Creating a campaign (and an ad group and an ad) for Search Network on Google Ads. Here we create raw ad information on Google Ads. The marketer (or the agency) then can finetune and start the campaign on Google Ads. SAP Marketing Cloud fetches the success information and makes it available for success reporting. Linking an existing Google Ads (Search Network) campaign. After linking the Google Ads campaign to one campaign on SAP Marketing we fetch the success data. Use case: Many customers have marketing agencies that manage digital campaigns. To tie back the campaign success data along with platform costs SAP Marketing just links to the Google Ads campaign. With this success data can be compared cross campaigns and cross campaign types as well as actual cost data can be run against spend budget. This feature allows to continue the working model between the marketing department and the marketing agency yet giving the marketing department more transparency. Do you work with agencies? No problem, this integration supports you and your agency to do the work even better. Your marketing agency can target people even more specifically by using the user lists. The user lists are loaded by your marketing department, there is no need to send your most valuable customer lists unhashed to anybody outside your company. The user lists are automatically updated based on your schedule setting. You get the success data of the campaigns and can compare actuals vs planned. The Google Ads integration can be found in the campaign. When you create a campaign, select the “Paid Search” tile. In the campaign flow you can select whether to create or assign a Google Ads campaign. Creating or assigning campaigns currently supports Search Network campaigns only. For either scenarios you can add an audience / a target group which then is replicated as a user list to Google Ads. To create a user list on Google Ads it is necessary to do it via a campaign, however it isn’t necessary to activate or use the particular campaign on Google Ads side. The user list can be used where ever needed in Google Ads. Both scenarios fetch success data from Google Ads. to install the app for Google Ads integration. See SAP Developer Hub SAP Marketing Cloud Google Ads Paid Search Integration. On SAP Marketing Cloud the integration scenario SAP_COM_0030 describes the setup in more detail. Good to know about the integration panel and targeting areas. we need more stuff on how does it works, is the platform does bid management’s only or else can we try to get the competition analysis throughout the search journey. what about the analytics platform and integration with the sales and revenue output. kindly provide elaborated stuff so that advertiser can interact with you. definitely we will add more information over time. Thanks for the detailed information . Appreciate the same . We are doing the Adword integration and even getting the Google Adword account name in Hyris Marketing . But while releasing campaign we are getting an error OperationAccessDenied.ACTION_NOT_PERMITTED . I saw a blog in google group forum where it says this happens because of access level of the Adword user account being used for creating the Google token. Is there any pre-requisite what should be the Google Adword user access level for SAP Integration content to work ? . we will follow up on your question but kindly understand that I ask you to create a ticket for this on the OSS / BCP. Then we can internally drive a solution much easier. Does the Hybris Marketing integration tie into this by Linking to an existing adwords campaign or is this integration not possible? I’m configuring Google Adwords integration with SAP Mktng Cloud according with the SAP guide https://help.sap.com/viewer/65e50a5c66c04e8aa7edcbade3c50eb6/1811.500/en-US. Everything looks fine in SAP CPI and SAP Mktng Cloud, but when i try to test te integration with GoogleAds campaign to see the googleads accounts lists, its empty. I dont know if maybe i need to do something else in the configuration. 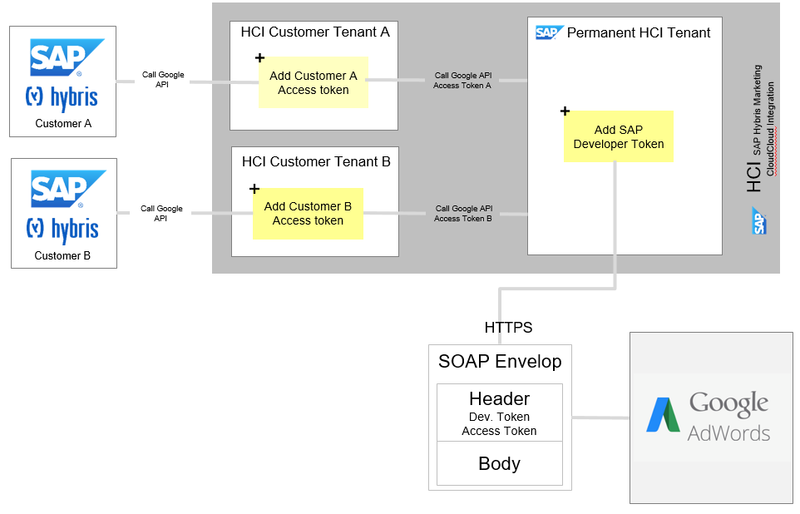 Please take a look at this link, you need to create an SAP support ticket so that we can grant access for your SAP Cloud Platform Integration user to communicate with the SAP Central tenant. I create the SAP Support Ticket, and SAP Answer that the permission was granted. But, the google accounts lists still appears empty. Is there a log when i can see more detailed info? According with the guide, i trigger the integration service with postman. It show us correct info, and we can show the interface in SAP CPI Monitor. But, when i create the campaign in SAP Mktng Cloud, the account list still empty. Can some one help me please? I created a support note today. Have you solved this issue. I am also facing the same problem. The Google Ads account selection is empty and only the campaigns id are available (when assign is chosen). Is there an additional setup that I need to complete? Hi Noor, Actually, we solved the problem. Te issue was in the access token. I start to configure the integration again, and it works. Hi Carlos, are you able to see the ad clicks as campaign engagements on contact journeys? Please, does this integration put the campaign data on the contact Journey history? If so, what is displayed? Google Ads success data unfortunately are (similar to Facebook campaign success data) only on aggregated level, they are not delivering any information that we can load as interactions and then attach to the contact’s profile. However if you use the Google Analytics integration that fetches the link to the paid campaign and out of this interactions are created and then show with the contacts profile if the contact is a known user on the webpage.